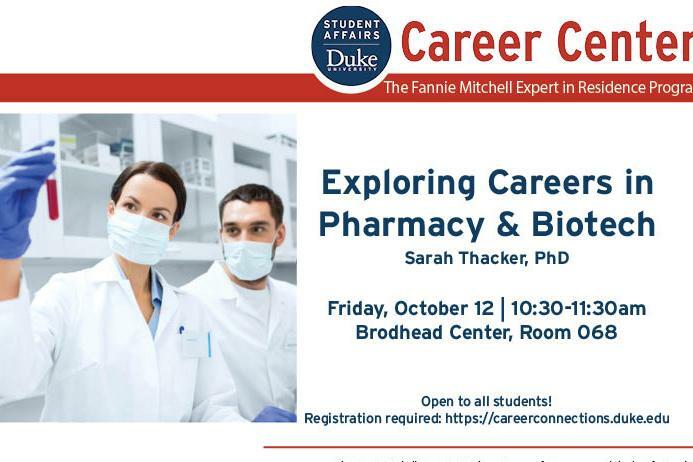 Hear from Sarah Thacker, PhD, about her journey from pharmacy school to a career in biotech. Sarah is the biology lead for San Francisco-based Vitrisa Therapeutics, a biotech firm with research labs right here in Durham, NC. In this position, Sarah works to validate the biological activity of novel therapeutics for ocular diseases. About Sarah: Sarah E. Thacker received her Bachelor of Science in Chemistry from Washington College in Chestertown, MD in 2010. She continued on to the UNC Eshelman School of Pharmacy to complete her Doctor of Philosophy in Pharmaceutical Sciences in 2015. After her graduate studies, Sarah pursued a postdoctoral fellowship with UNC Institute for Drug Safety Sciences (formally part of the Hamner Institute) where she worked on an industry sponsored project aiming to discover biomarkers for idiosyncratic drug induced liver injury. Currently, Sarah is a Lead Biologist for Vitrisa Therapeutics in Durham, NC.